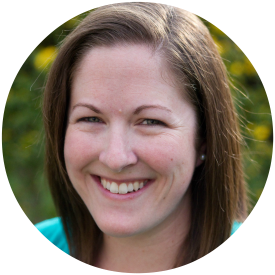 I’ve been working super hard behind the scenes to switch this blog baby of mine over to a new, upgraded website! While I was at it, I gave my entire site a makeover! 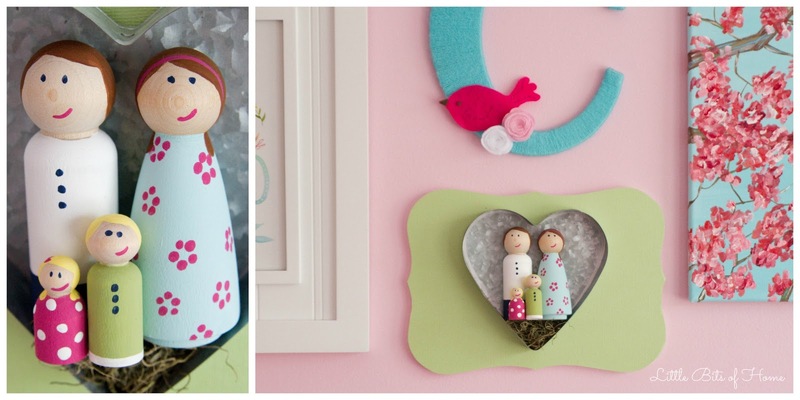 Wahoo for digital decorating! 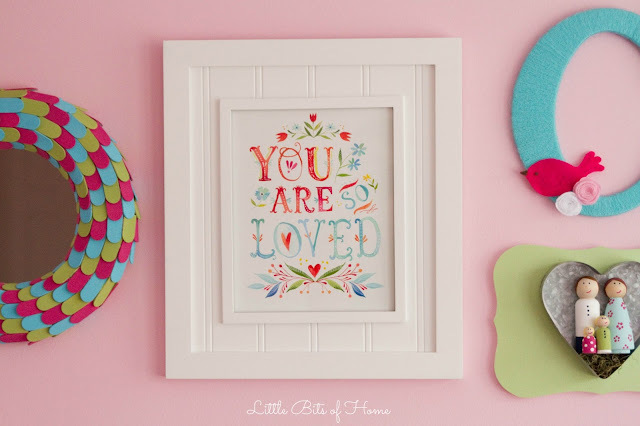 Please click over and check out the new digs at Littlebitsofhome.com and be sure to check out the giveaway and free printable! Hey, Friends! 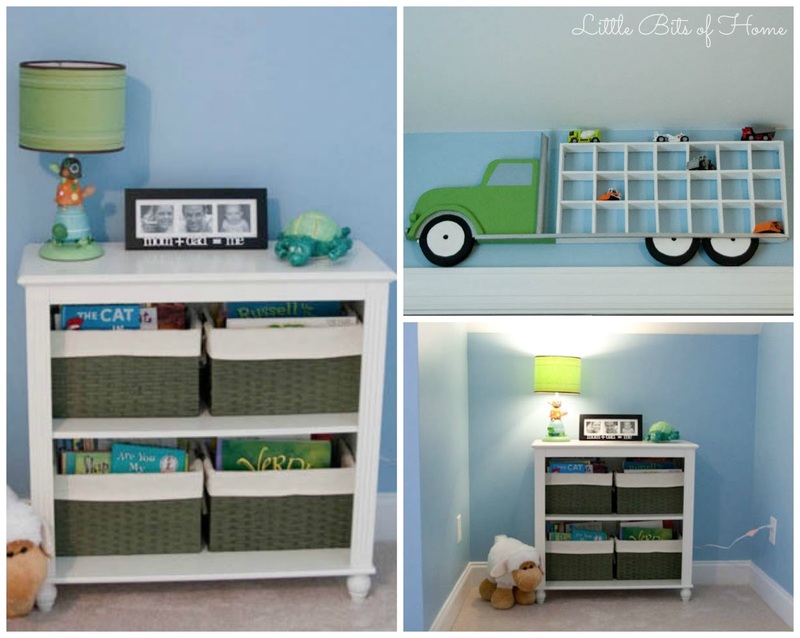 I'm so excited to share that we are embarking on our second One Room Challenge this month! The One Room Challenge is put on by Calling it Home every April and October and is so fun! The challenge is to take one room in your house and give it an overhaul in just 6 weeks, posting and sharing your progress every week! Remember last fall when we redid our entire bathroom? Guess what we're up to this time? Little Man's room! He has been slowly outgrowing his nursery the last couple of years and as much as I try, I just can't seem to slow down time and keep him little forever. So, forward we go! 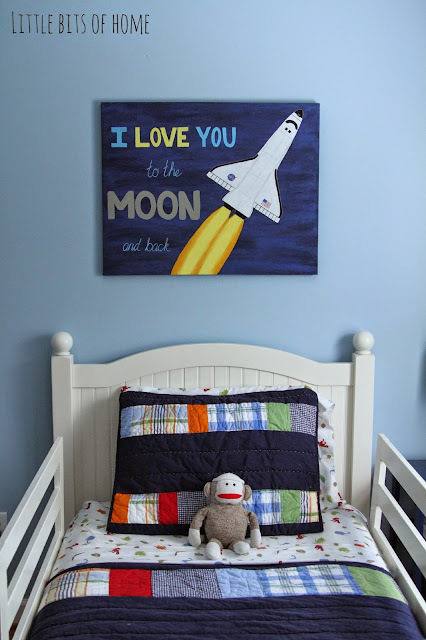 This month, we're taking his room from nursery to big kid! ...while I grew our tiny human. Here I am a day before giving birth. 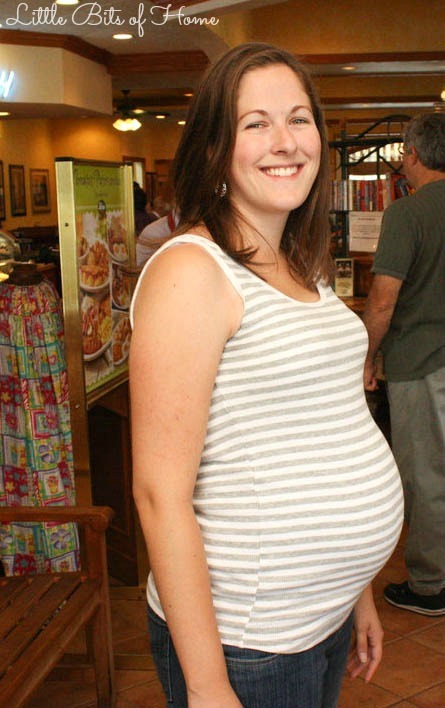 Just kidding, I was only 5 or 6 months pregnant here. I have the shortest.torso.ever. When I'm pregnant, I look really pregnant. Go big or go home, right? Here's the last belly picture (36 weeks maybe?) 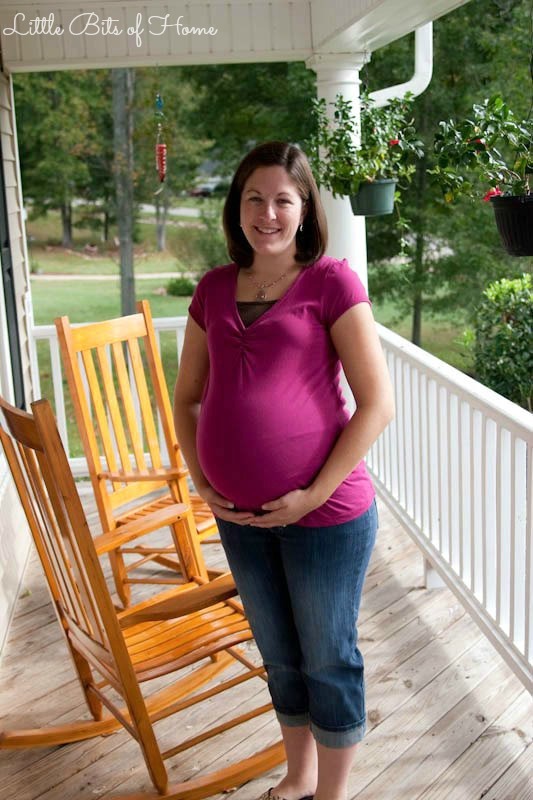 before Little Man was born... basketball belly, mom haircut, swollen face and ankles, oh yeah! 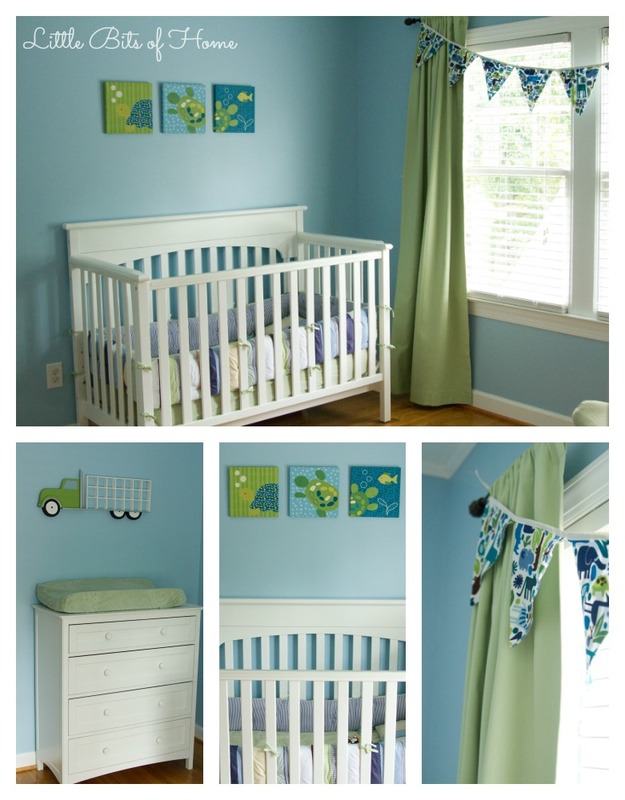 So, back to the nursery. Jeremy's one request was that we paint it blue. I couldn't pick a paint color for the life of me and ended up crying at the paint store because I couldn't decide on a color. Pregnancy hormones don't play, folks. Ha! We did bring in some turtle accents, though, which we both loved! The turtle lamp was from my Grandma and aunt and I still love it. The ceramic turtle was an art project Jeremy did in high school! We also had the cutest turtle mobile ever, but I can't find a picture of it. Sad times. The truck was from Jeremy's childhood and his parents collected fun construction vehicles for Little Man to display on it. Our old house had some cool sloped ceilings, which made for a fun little reading nook in the nursery. That was my favorite spot in the room! 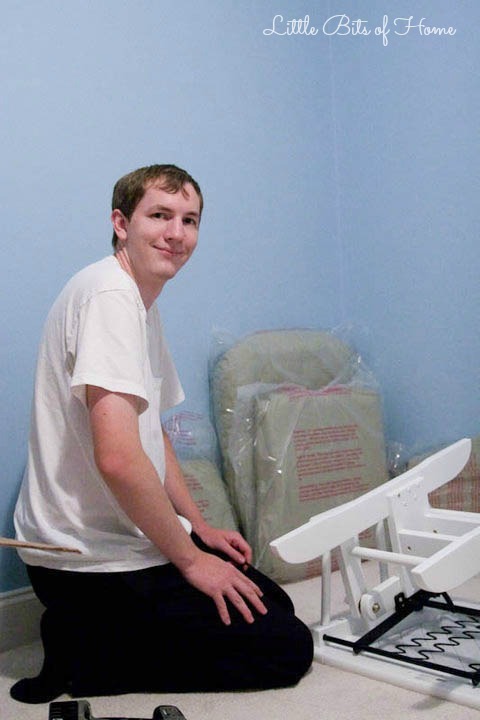 When Little Man was one, we moved into our current house. 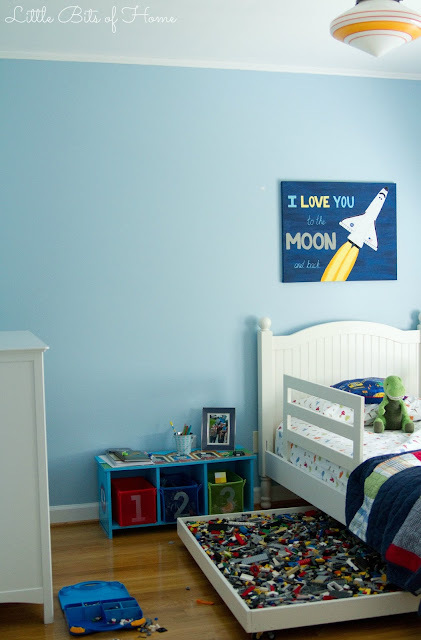 To try to keep things calm and familiar, we painted his new room the exact same color and decorated it pretty much the exact same way. I did learn to get longer curtains, though! Here's how his room is looking now. I left the table out just how he left it this morning so you could see how little floor space he has left when he's using his table. That extra closet shelving we added is still waiting for paint. Clearly, we just purged. 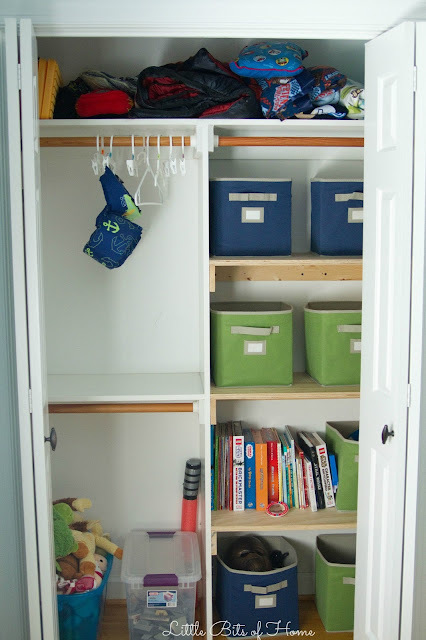 This closet is usually a mess because the storage bins are not all within reach for Little Man. Ready to see where we're headed with the room? 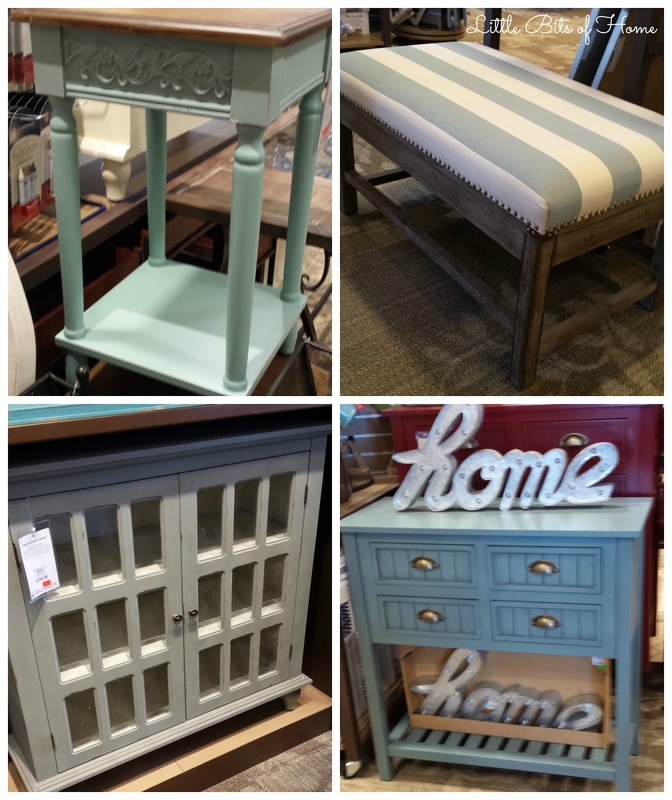 Images via Pottery Barn, Rugs USA, I Love Print, I Heart Organizing, Apartment Therapy, Sherwin-Williams, and Renovation Tracker. -Add Star Wars art and accessories. 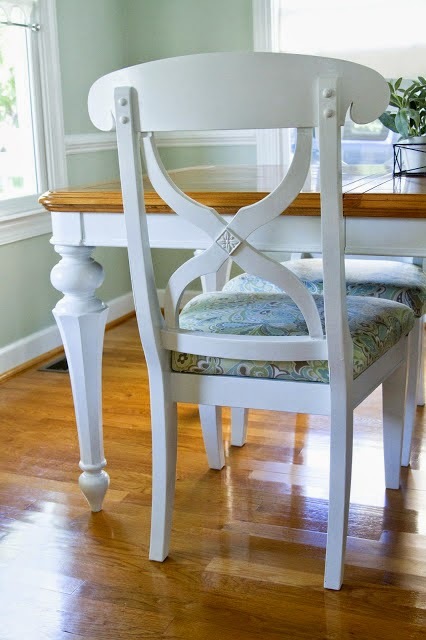 -Build window seat with storage. 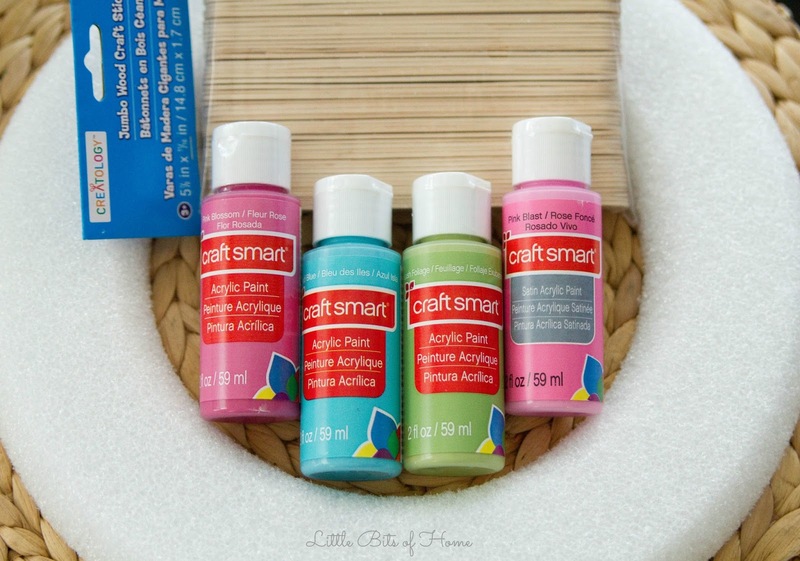 -Add storage solution for art supplies. -Get rid of dresser and add closet clothing storage. 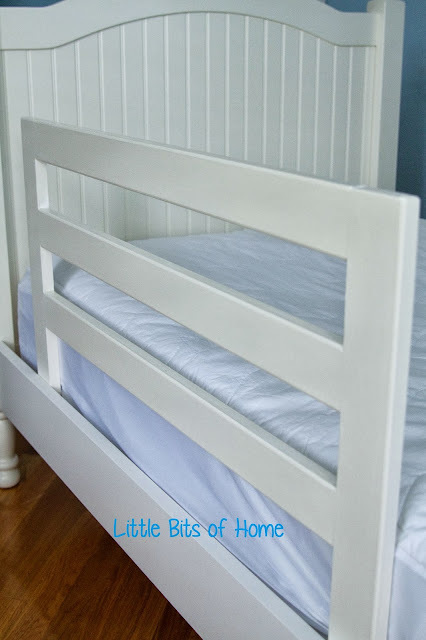 We plan to keep the light, his bed, nightstand, and bedding which definitely helps out the budget! We decided to keep our room design plans a secret from Little Man and are going to try to pull off surprising him. It's like our own little version of HGTV over here. Ha! I can't wait to see his face when he sees his room and realizes we encorporated Star Wars! 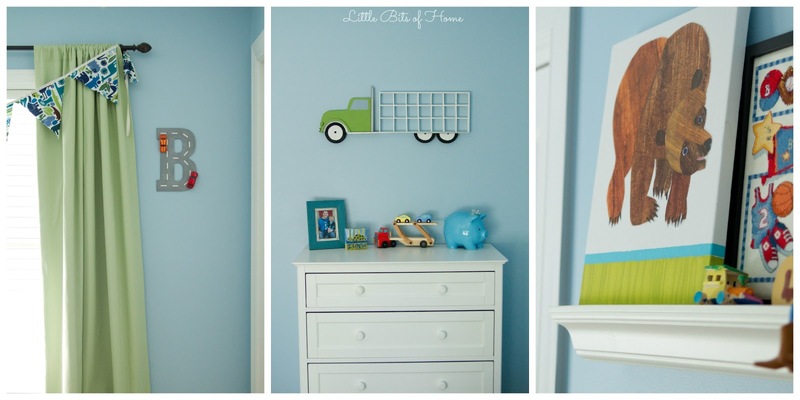 I hope you follow along as we overhaul Little Man's room! Be sure to check out all the other awesome room makeovers going on this month, too! There's some serious talent going on over at Calling it Home! 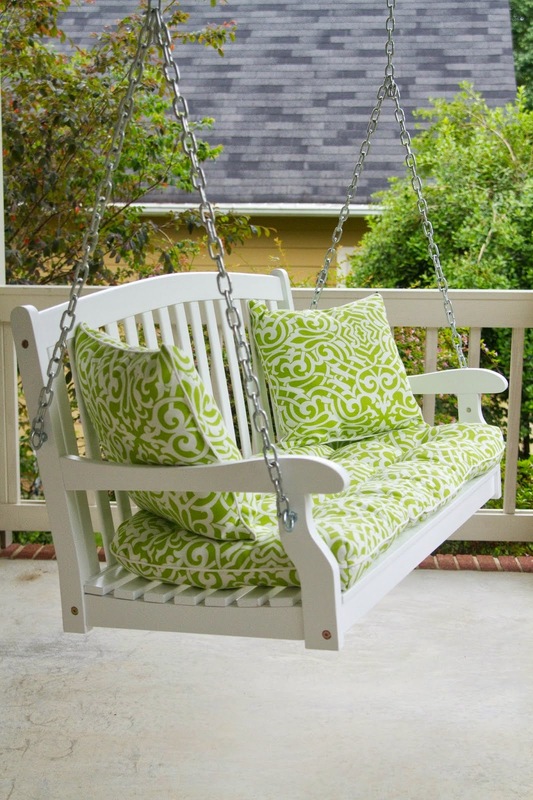 Linking up with Savvy Southern Style, Remodelaholic, and many other awesome blogs! Hey, Friends! Sometimes, I wish we could all just pile in the car and take a shopping trip together, don't you?! But, since geography seems to be a bit of a problem for that plan, I decided to do the next best thing-- snap pictures while I shop! Come along with me on my recent trip to Kirkland's! First up, this bottle table runner is my absolute favorite! I asked for it for my birthday. Crossing my fingers that I get it! I know, I know, I could just DIY one, but sometimes it's nice to get something already assembled, you know? And check out the table it's on! Swoon! Kirkland's has some great accent furniture! 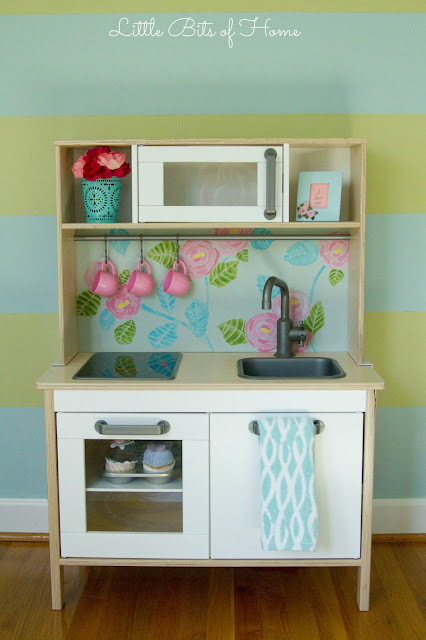 That cabinet on the bottom left reminds me of my teal cabinet. It'd be the perfect stylish small space storage solution for a dining room! And that table on the bottom right would look amazing in an entry way! 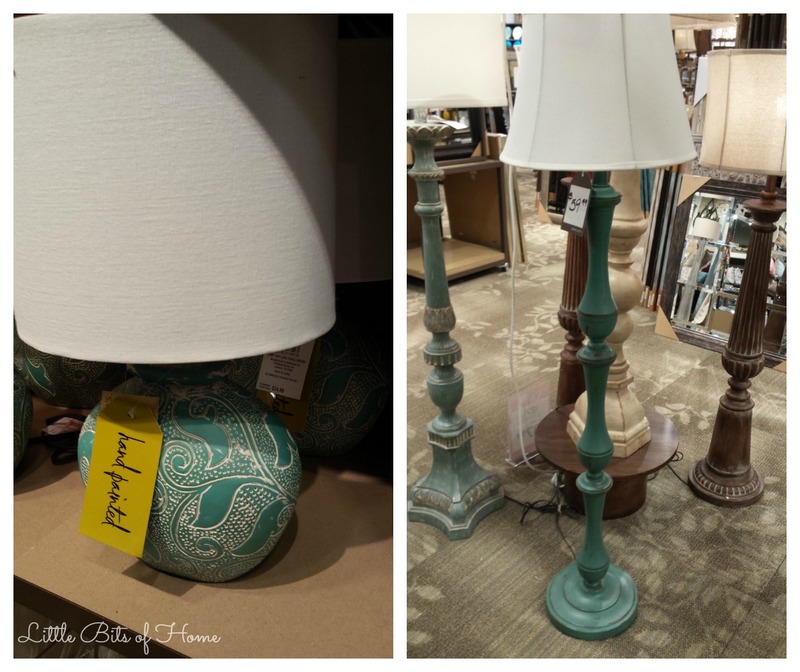 The lamps were all unique and very reasonably priced! I swooned over the large wall decor! 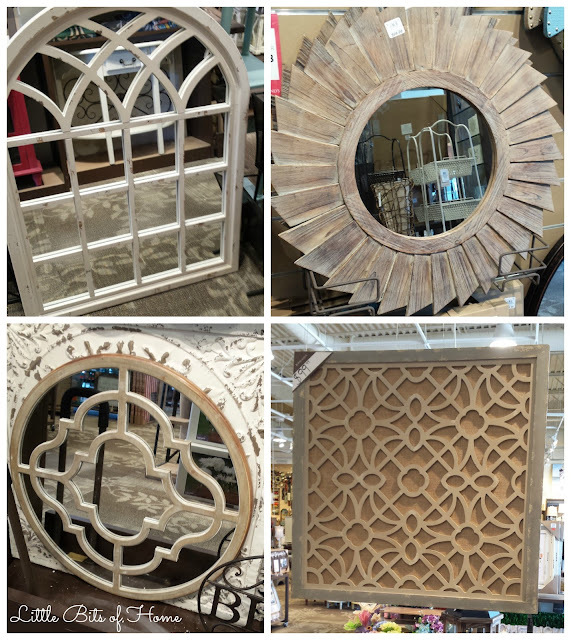 The arched mirror would be amazing on a fireplace mantle, wouldn't it? 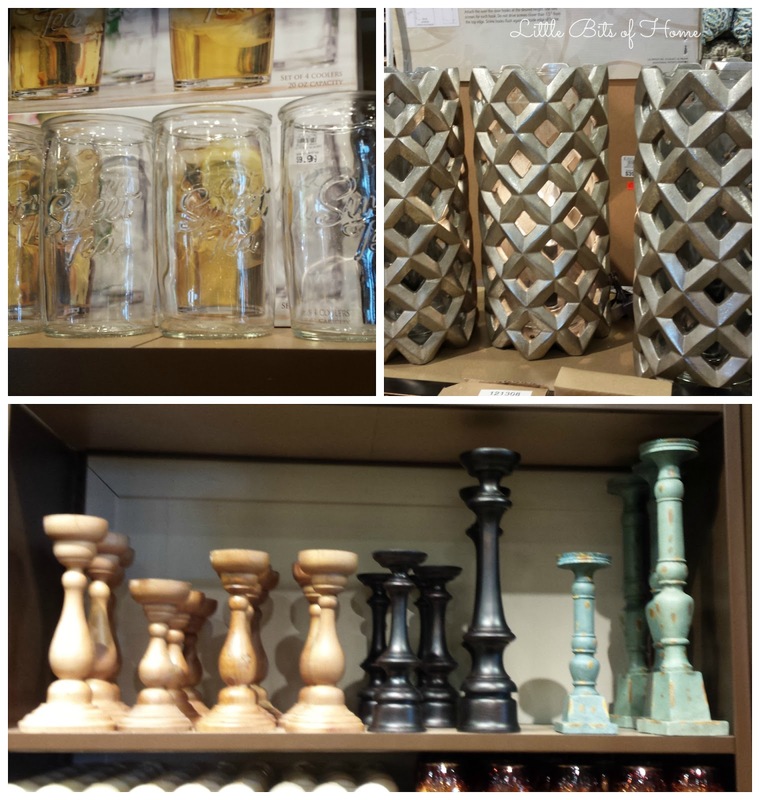 The wood art on the bottom right catches my eye every time I go into Kirkland's! Their mirrors are always super well priced. 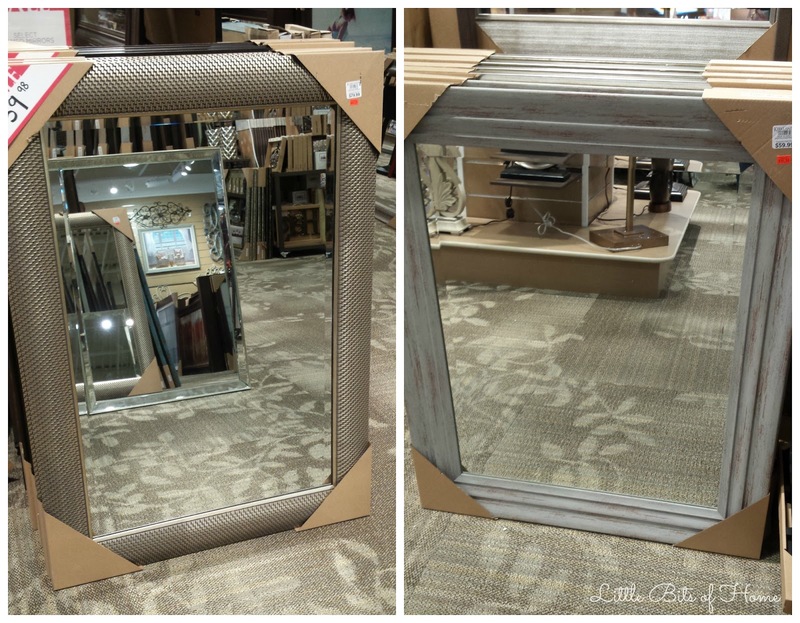 If you are doing a bathroom remodel, check Kirkland's for your mirror first! They're big, have great frames, and are a fraction of the price of the hardware store mirrors! There were lots of cute accessories, too! I loved this set of sweet tea cups and they were on sale for only $8! It took all of my willpower (and remembering I have an overflowing cup cabinet) to not buy them! 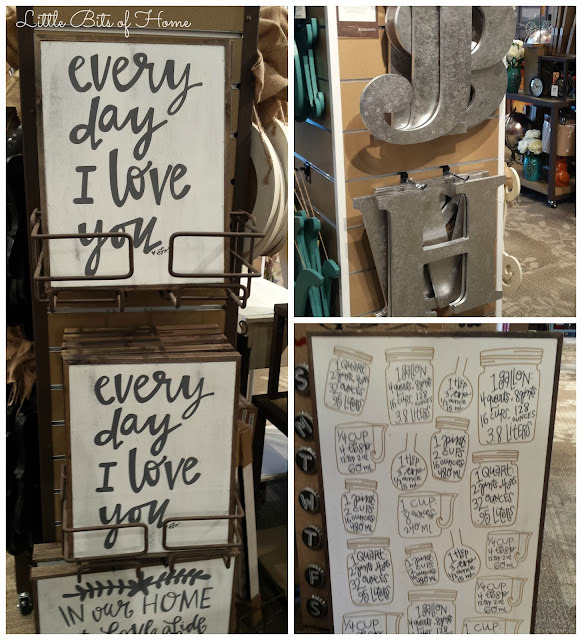 This was actually my second trip to Kirkland's lately. Last week, my bestie Amy and I were supposed to be working out at the gym but somehow ended up at Kirkland's. I have no idea how that happened... ;) We both loved the wood signs! 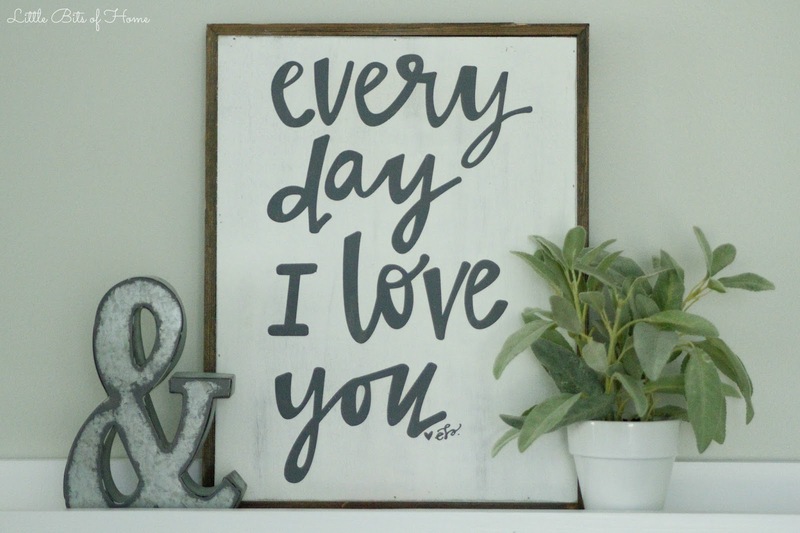 They're the same style as my DIY wood sign, so you you could totally make them yourself using my tutorial! Amy went home with that adorable measuring units sign. My picture of that stinks, but you can see it better here. It's SO cute! Ok, ready to see what I bought? Both things were on clearance and I stacked a coupon on top from Kirkland's Spin it to Win it app! I thought this sign was perfect for my dining room! 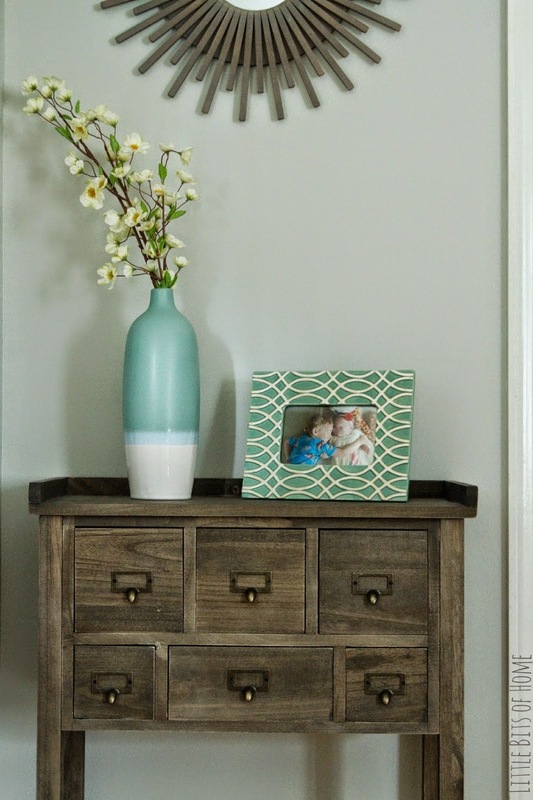 I love the saying and how the text picks up the teal in my teal cabinet. The sign I showed you above had me at hello! It's in our bathroom for now, but I'm thinking it'll be perfect in Jeremy's office! Did you enjoy this little shopping trip? What store would you like to see next? Hey, Friends! I'm so excited to share our updated nursery gallery wall with you! 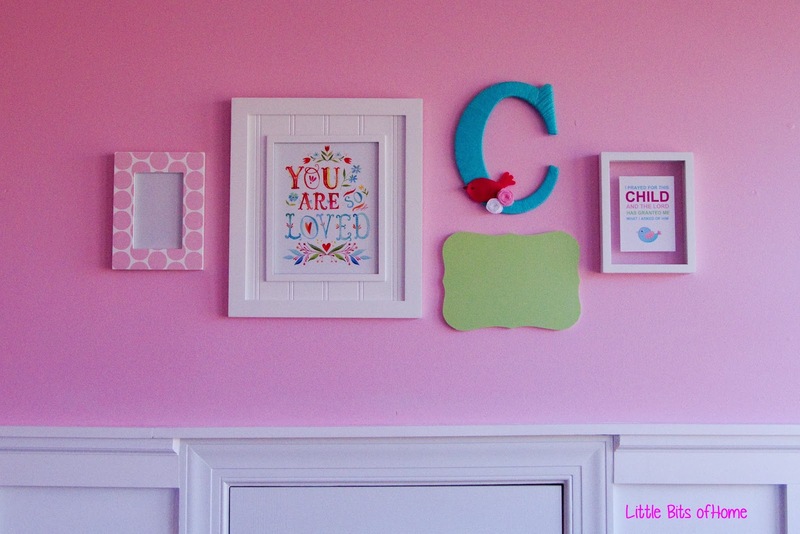 You may remember, this is what Little Girlie's gallery wall looked like while we were waiting for her grand arrival. After she was born, we added a picture of the kids to the polka dot frame and her footprints from the hospital to the green plaque. I loved it and it stayed like that for the last two years. Recently, though, we have had to switch a few things out. The footprints were fading from the window light, so I took those down. Then, after my Grandma passed away, I brought home a painting I had done for her a couple years ago and decided to add that to Little Girlie's gallery wall. Here's how it's looking now! 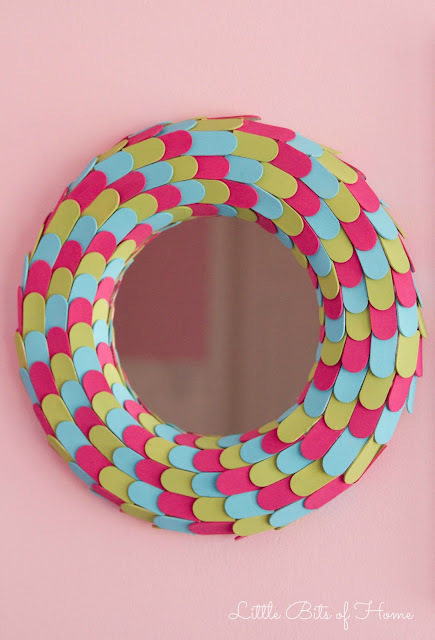 See where my popsicle stick mosaic mirror landed? I just love it! 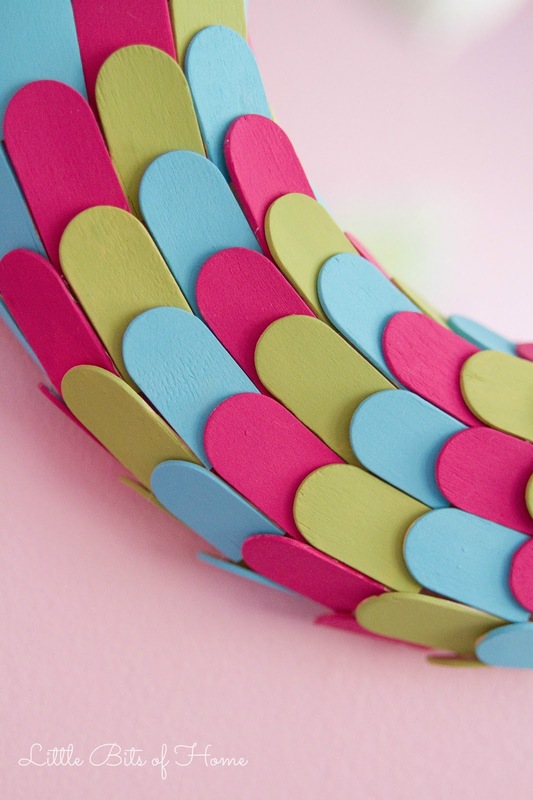 Who knew I could love popsicle sticks so much?! See the full tutorial here. I'm still head over heels for this print from Katie Daisy and the letter C that I ordered from a friend for Little Girlie's room, so those two things stayed put. I fell hard for Bre from Average but Inspired's peg doll family, so just had to make one for our family! 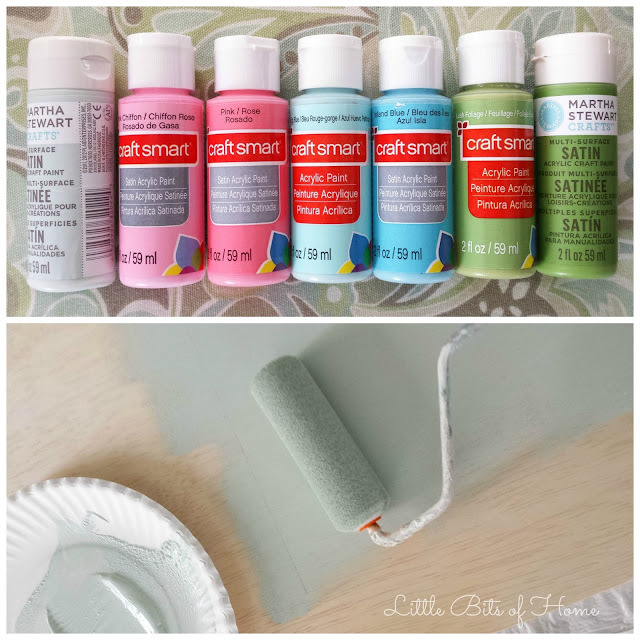 You have to check out Bre's and her tutorial over on her blog! My little peg family fit perfectly on the green plaque and brings a giant smile to my face whenever I see it! Here's where the painting I did for my Grandma's 93rd birthday landed. I painted this for her a few months after she broke her hip and moved into a nursing home. 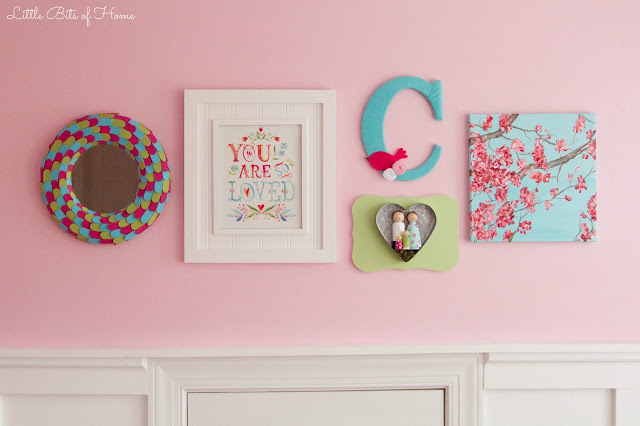 I wanted something bright and cheery for her room. I was inspired by a gorgeous painting at World Market. It's such a happy/sad feeling to see it in here. It can be a painful reminder that Grandma is gone, but it also makes me smile that Little Girlie has this link to Grandma in her room. I'm loving the changes! Amazing how just a couple changes brought a whole new life to the wall! 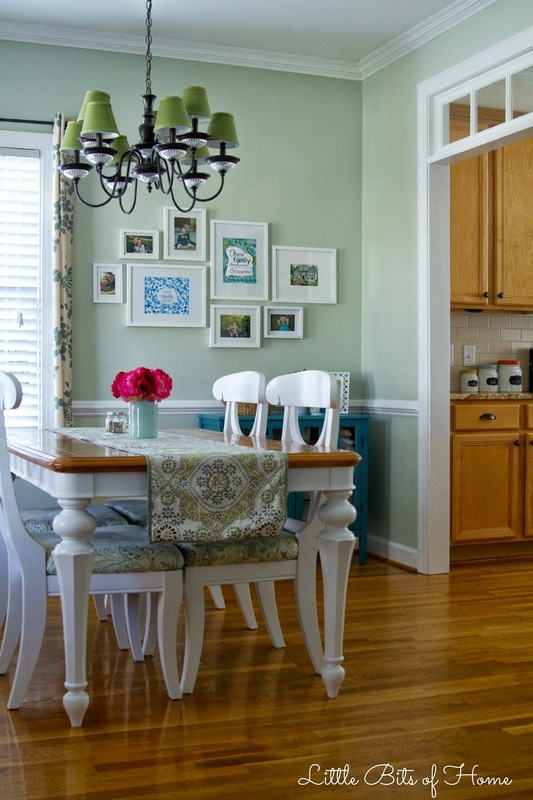 See Board and Batten Makeover here! 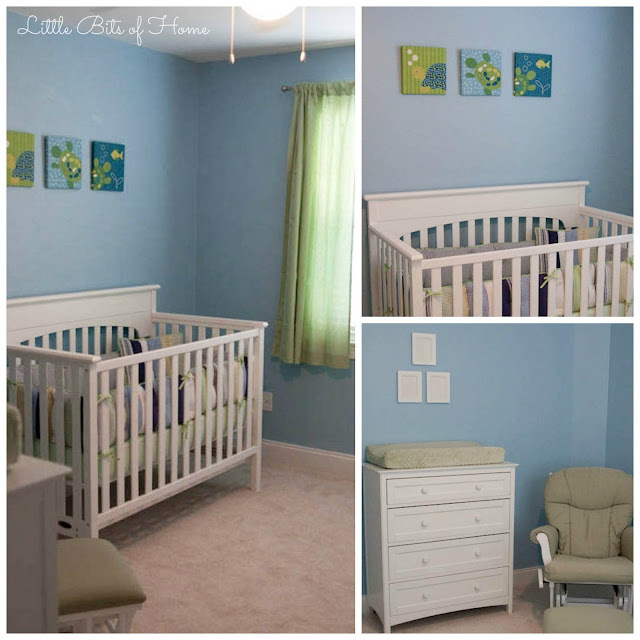 Catch up on all of the nursery posts here! 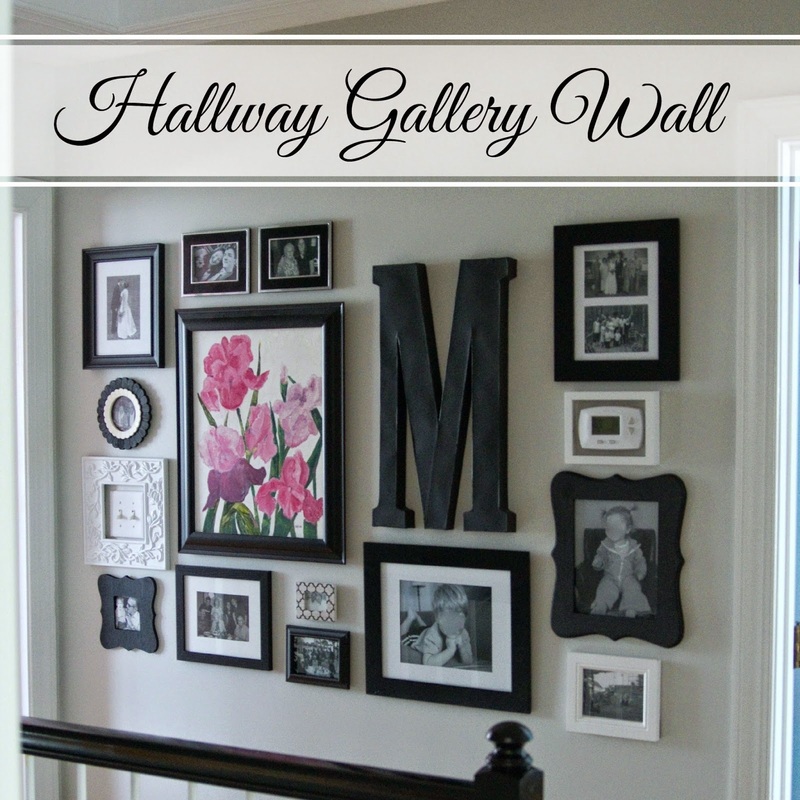 Linking up with Savvy Southern Style, Remodelaholic, Thrifty Decor Chick, and many other awesome blogs! *Affiliate links provided for your convenience. For more info, see my full disclosure here. It's finally starting to look like Spring around here! Flowers are blooming, trees are getting leaves, and pollen is descending upon us in clouds. Ha! With all of the color outside, I was itching to bring in some vibrant colors inside! I've been needing something round to complete Little Girlie's gallery wall, so I decided to make her a super colorful mirror! I wanted the mirror to incorporate the colors in her room and have a bit of texture. After a bit of brainstorming, I came up with a design that used the most unlikely of materials... popsicle sticks! Here's what you need to get started! I started out by prepping my popsicle sticks for painting. I only needed the rounded tips, so cut the sticks in half so I could paint both tips at the same time. I knew I needed to get the tops and the sides/tips painted and would have a million to paint, so came up with a quick way to paint them... tape them hanging off the edge of the counter! That way, I could paint them all at once and could easily get to the sides without them sticking the a surface. 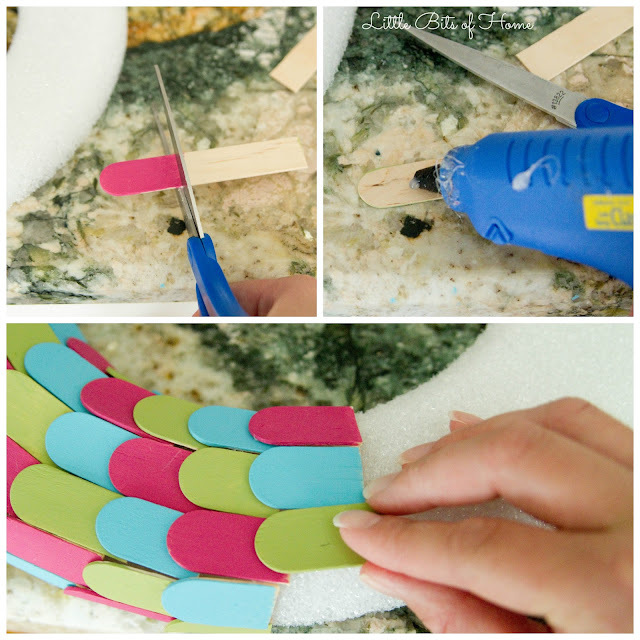 Quick tip: I taped them on in groups of 10 for easy counting. Of course, I underestimated just how much counterspace I'd need to tape 240 popsicle sticks onto! After I finished taping, I stepped back and surveyed the kitchen. It looked like a crazy town. 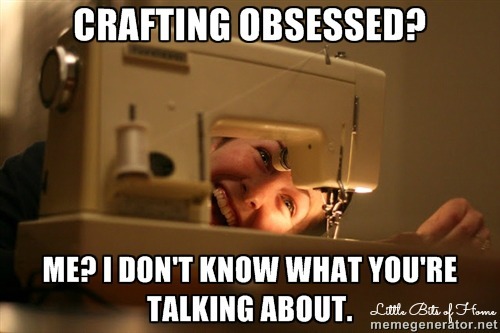 It was then that I realized I had crossed over to the crafting dark side and needed to be admitted into a support group. People probably fear coming to my house for fear that I'll paint doodles on them or hot glue embellishments to their clothing. Anyway, back to the crazy town kitchen with 240 popsicles hanging on for dear life... I gave them all two coats of paint and am happy to report that my wacky taping method worked wonderfully. I was done super fast! 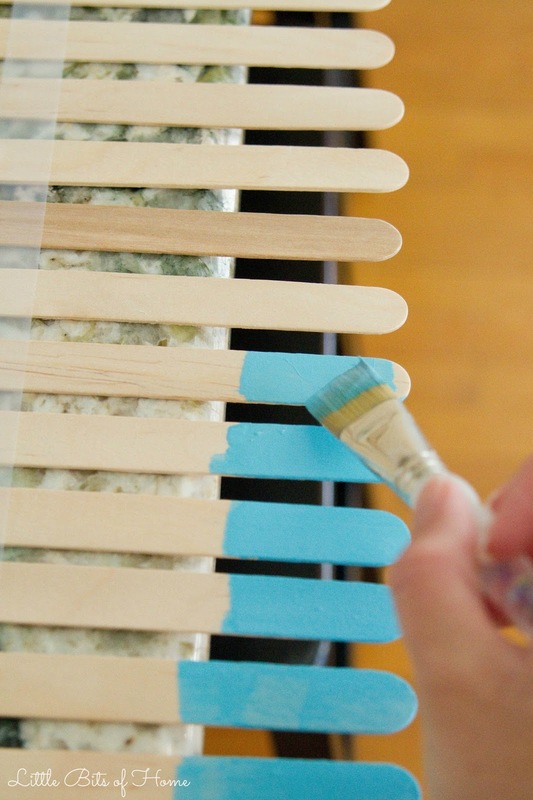 Side note, if you wanted a more neutral color scheme, you could stain the sticks different shades instead of painting them! Ohhh, so sophisticated! :) If you do that, tag me in a picture. I want to see! 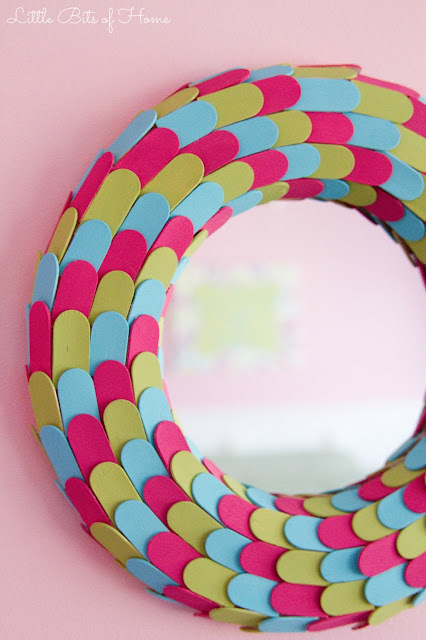 To assemble, I cut the popsicle sticks down and glued them on to the wreath form in overlapping rows. I worked in vertical rows until I had gone around the entire wreath. It's helpful to cut the sticks as you go because the inner ones need to be a bit shorter (about 3/4") and the outer ones need to be a bit longer (about 1- 1/2"). 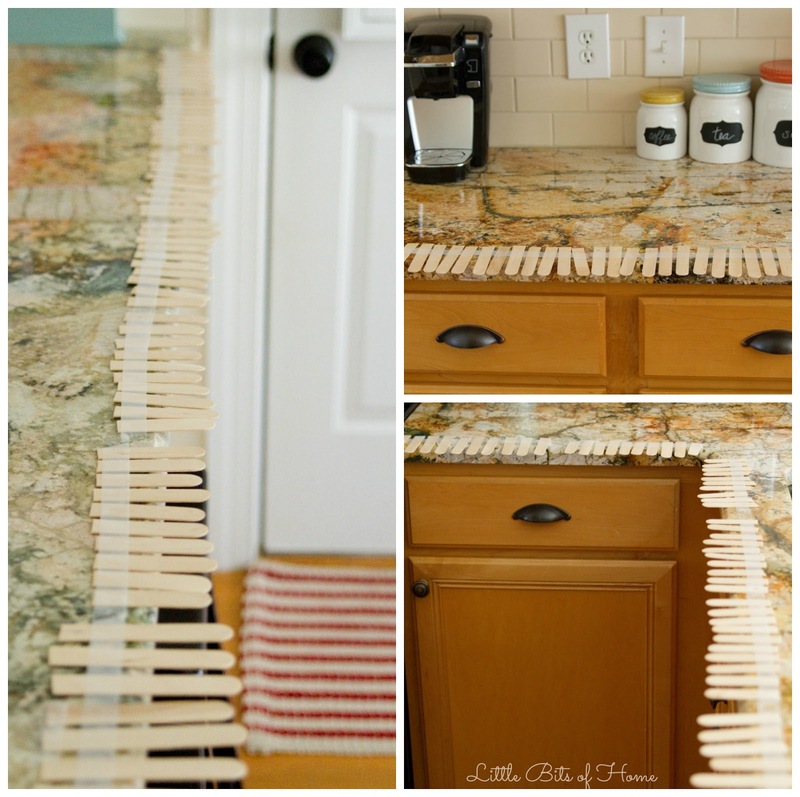 I could only get in 5 full rows across of sticks, so ended up cutting my popsicle sticks lengthwise to create a sixth row and cover the remaining exposed outer edge. 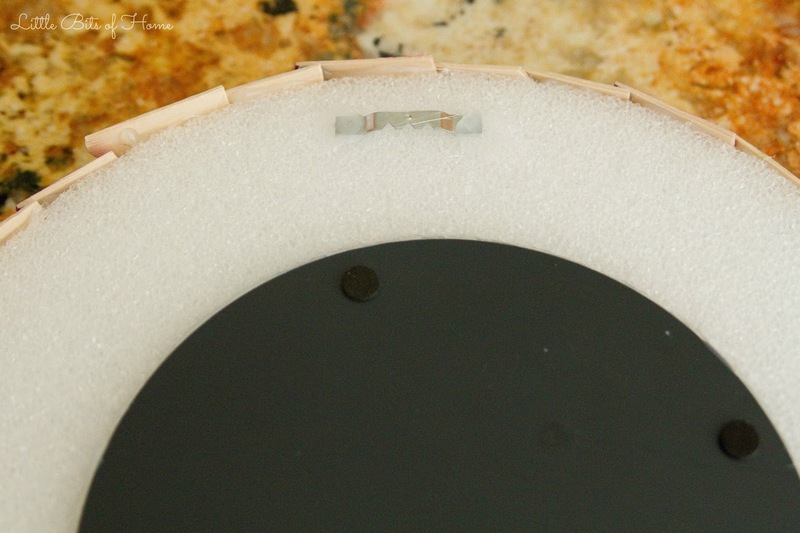 Quick Tip: When you start, only glue the first row near the straight end, leaving the curved tip unglued. 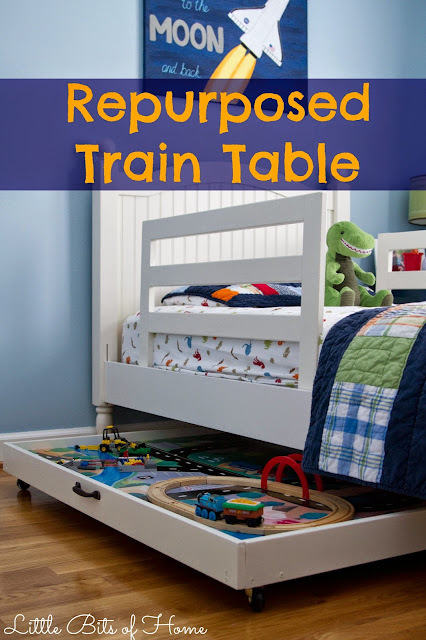 This will allow you to slide your last row under your first row and avoid a start/stop seam. 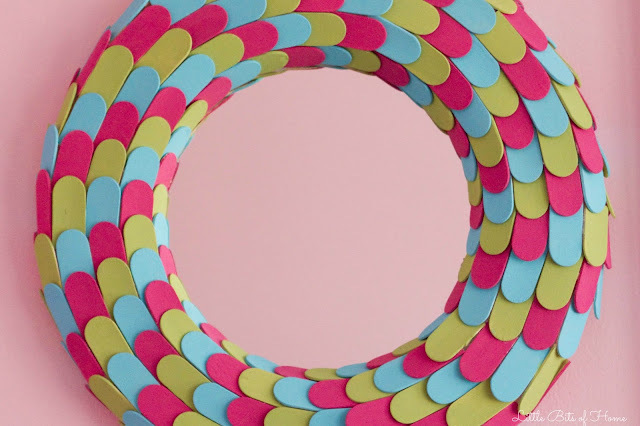 When I was done, I simply glued a mirror and picture hanger onto the back! It was a bit of a process, but really so easy! I just love how it turned out! Hey, Friends! 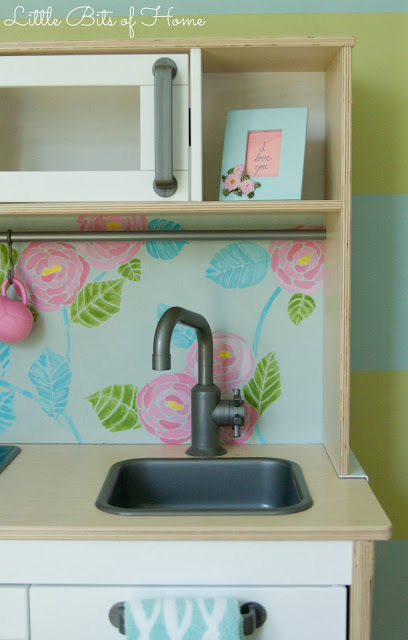 I've been so excited to show you this little Ikea hack for months now! 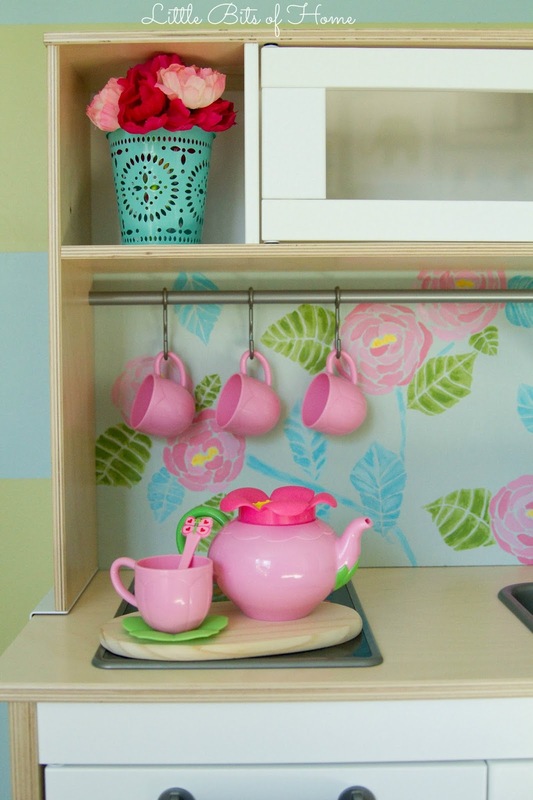 Little Girlie had been raiding my kitchen pans and utensils for items to play with, so we decided to buy her the Ikea play kitchen for Christmas. I was super excited to give it to her since I loved my play kitchen as a kid! Of course, you know I just had to jazz it up a bit for her! Little Girlie is into pink and purple, bows, jewelry, and accessories right now, so I wanted to give it a feminine touch without being too in your face pink, if you know what I mean. ;) I have LOVED this Anthropologie wallpaper for years and wanted to use it for the backsplash on the kitchen, but it was way out of the budget. Instead, I grabbed some craft paints and got to painting! We cut a 1/4" sheet of plywood to fit the opening in the back of the kitchen, leaving a lip so we could nail it in. After giving it a good sand, I rolled the entire thing in a pretty blue-green. For the flowers, I used two shades of pink for the petals and just randomly alternated the colors as I went around. If you look closely, you will see the petals are just blobs with a bit of blank space in between. Super easy! 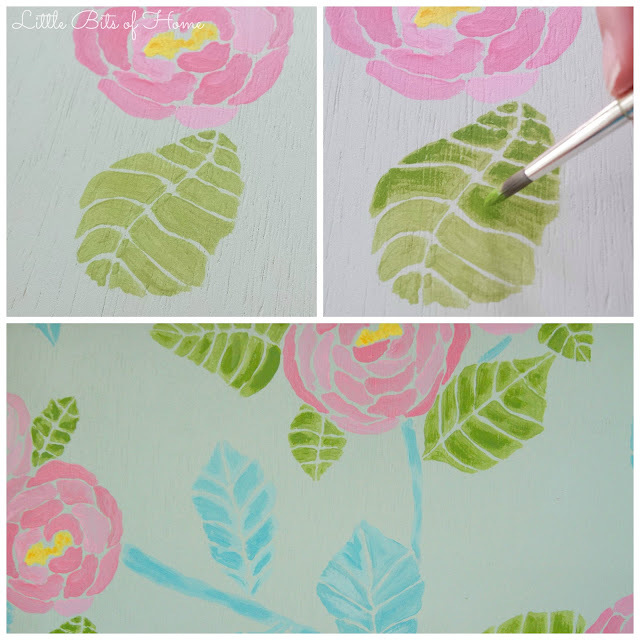 For the leaves, I painted them in one shade of green, then streaked on another shade of green. 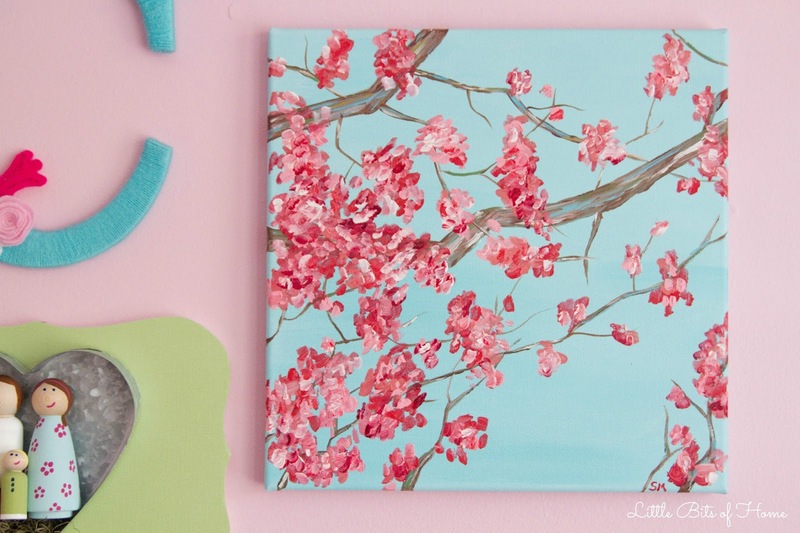 The trick here is to not have very much paint on your brush so the bottom color peeks through. Again, super easy, I promise! The centers are just yellow paint that I dotted on, followed by a few dots of darker yellow. I left off some of the details from the original wallpaper, because, elementary painting skills, that's why. ;) That's why I called it "Anthropologie Inspired" instead of "Anthroplogie Dead Ringer". Haha! After the backsplash was dry, we just attached it to the kitchen from the back! That's it! I really wanted to paint the wood parts of kitchen white, but decided against it for durability sake. I knew it would be played with hard and didn't want to worry about the paint chipping on the more trafficked areas of the kitchen. 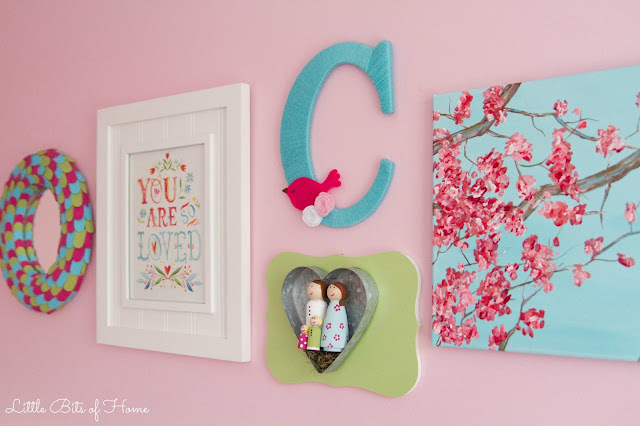 I love how the colors tie into the playroom decor and add a feminine touch! 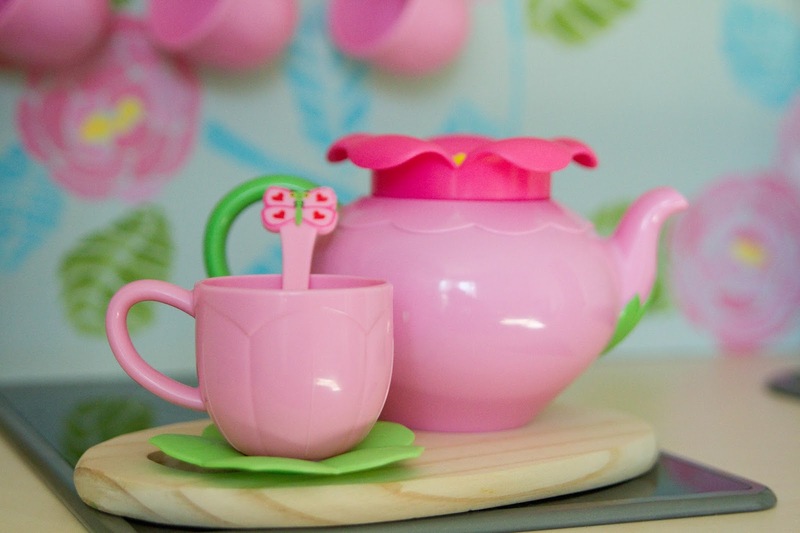 Now it's the perfect place to sip some pretend tea made by the sweetest little girl I know. I added a couple kid-safe finishing touches to the top cubbies since Little Girlie is too short to reach those spaces anyway. 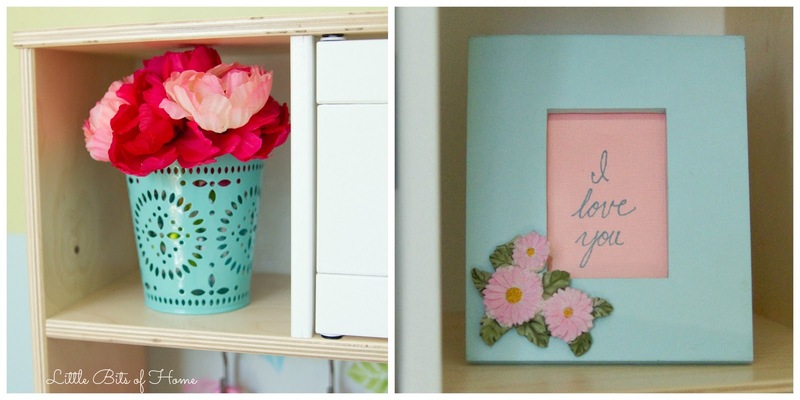 The tin vase is from the Dollar Spot and the frame was one my Grandma had that she picked up at the Dollar Tree. See where I get my dollar item obsession from? 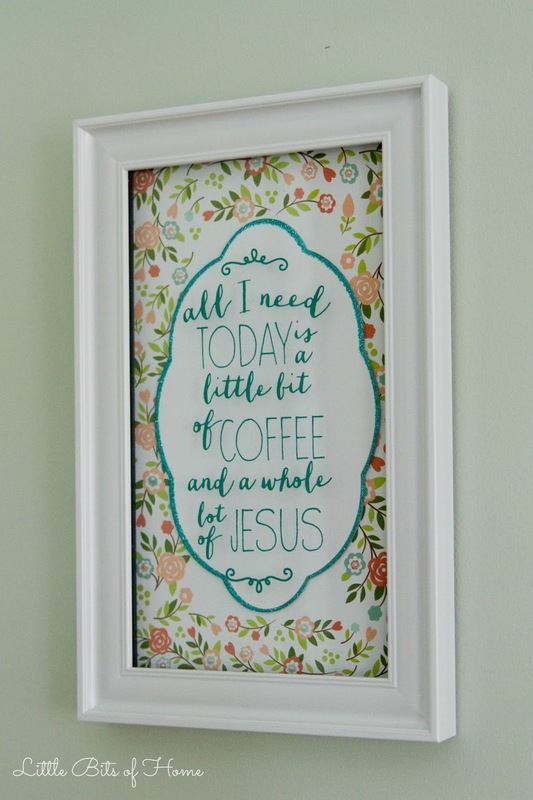 I like that the frame is sentimental and that it doesn't have glass in case it falls. Little Girlie was SO excited about her kitchen on Christmas day! She opened it up then ran over and gave me a big hug before playing with it. Love!